Large bush with creamy white flowers followed by small black berries above bright golden green splashed foliage. Needs full sun or partial shade on well drained soil. Ht & spread 6ft x 5ft. I hope you find a bargain or ten! Does he not get trade discount then? 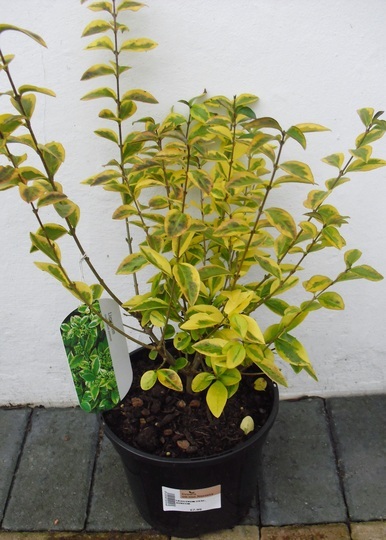 Lovely variegation Shirley..shame it would get too big for my garden..I shall have to stick with the Euonymous ! You got 2 lovely evergreen shrubs there. I háveď two golden Ligustrum on boh sides od a green hedge they are quite nice bit nôt so dense. Good plants to lift a dark area and can be clipped too. Sandra, as Dotty says, it can be clipped, so if it does get too much of a giant I'll have the shears at the ready! See who else is growing Ligustrum ovalifolium aureum. See who else has plants in genus Ligustrum.